The Paris Match BUK picture: Shadows, perspective, digital content, they all seem to be manipulated to construct an image of a situation that never was there. And that´s not the only alleged evidence Michael Kobs deals a serious blow. Is the JIT ready for some serious investigation? What everybody sees who has taken a clear look at it: it just doesn´t add up. 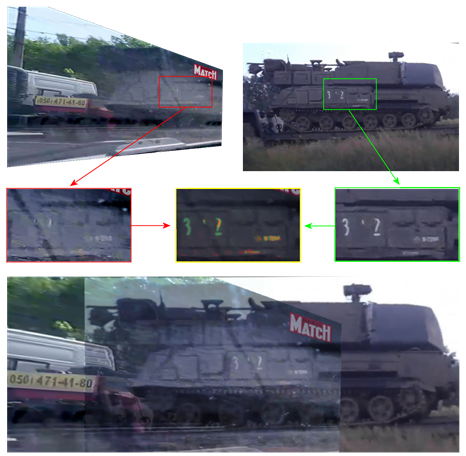 The infamous Paris Match image, a handycam still of a BUK launch installation waiting on the side of the road in Donetsk at the morning of July the 17th, 2014, shows some strange aspects, like a blurred BUK and a crystal clear unique truck. More strange aspects in the Paris Match picture. The sun is shining through the tank where the white striping of the mid-road roadmark is missing too. Its not the only target guestblogger Michael Kobs manages to deal a pretty tough blow. In his latest research report ¨Haunt the BUK¨, first issued in a German version, now revised and translated in English with an extra chapter on the Paris Match stills, he takes on a whole array of doubtful evidence. The importance of his study is huge. The Paris Match photo, the visual starting point of the BUK trail, served as the link between the official Russian army and the anti-Kiev rebels, desperately in need of heavy anti-aircraft weapons. To sustain this narrative, Bellingcat managed to draw a comparison between the BUK on this picture and a BUK tracked in the Russian convoy. Bellingcat manages to see huge comparison between the Paris Match BUK and the BUK from the Russian convoy. Maybe realizing their case wasn’t that strong based on this dubious image alone, they invented an ingenious method, the so-called ¨side-skirt fingerprinting¨. Side-skirt fingerprinting, a magical method to put the ¨corpus delicti¨ in a Russian convoy. Warping a Buk for comparison with this blurred Paris Match Buk would make a “pixel salat” that is forensically worthless, according to Kobs. 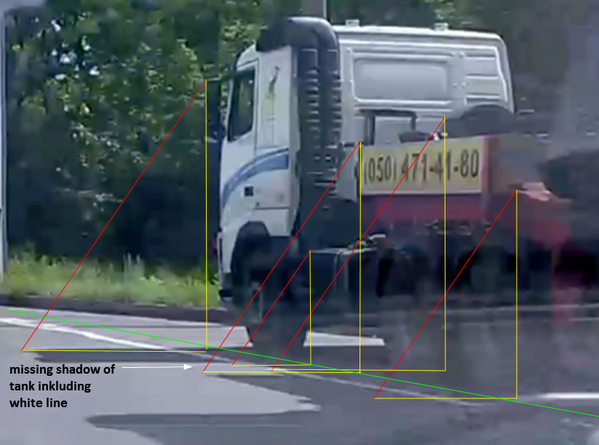 According to this technique the unique profile of the side-skirt of the murderous BUK displayed on the PM pic could be tracked being apparent in the BUK from the Russian convoy too. Kobs debunks both images and the ¨fingerprinting¨. The Paris Match photos, taken by an anonymous freelance photographer, allegedly at 11:00 AM in Snizhne on 17 July 2014. Both time of capture and site have been revised. Geolocation showed the truck was parked in Donetsk. Time of capture was revised to 10:45 AM (Bellingcat) and even to 10:05 AM (Ukraine-at-war in a recent blogpost), both to fit new evidence against the officially proposed timeline. The picture on top, the more cropped one, was first issued in Paris Match edition of 25th of July. The second picture (below), which shows more of the back of the BUK, came out a few months later. 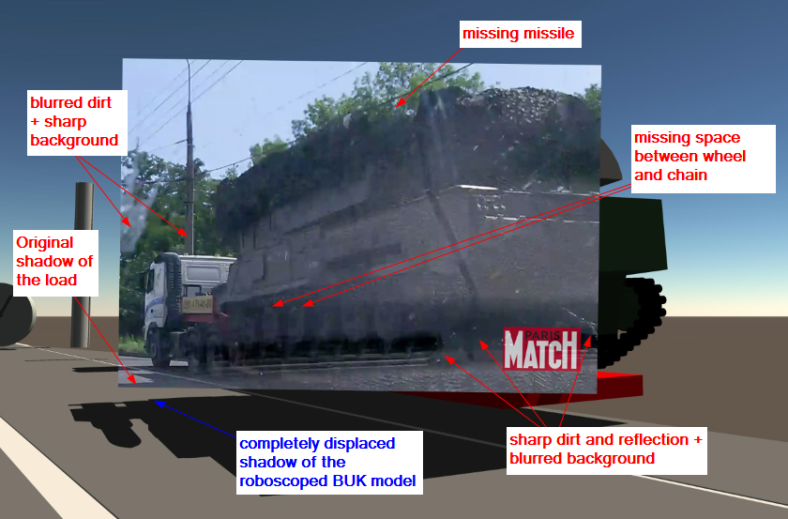 In his report Kobs provides these overlays with shadow-casting models of the truck with BUK to show the BUK could have been digitally inserted. In fact, a piece of the shadow of the original load can be detected at the right side of the shadow casted by the yellow plate. Reading this astonishing piece of dilligent work will make it obvious to everyone. After debunking the two faced BUK launch plume together with ¨Ole¨ (see this blogpost), Kobs has succeeded in debunking the Paris Match photo, while at the same time doing some serious damage to the probably fake Ukrainian story of a Russian BUK that was dragged to a south of Snizhne launchsite. Reading Kobs one may consider that an old saying might apply: Whenever a story seems to good to be true, it usually is. Maybe the Joint Investigation Team could pay attention. The entire handycam video from which the Paris Match stills were extracted, was released on the webiste of the Dutch police after the 28.9.2016 JIT presser, which showed preliminary results of their investigations into weapon and launch site. The video does not have any relevant metadata, but the file name, if original, gives a precise (but unconfirmed) timestamp. “The filename is “vid_20140717_102354.mp4″, so the video was supposedly shot at 10:23am.”, according to Bellingcat’s Aric Toler. A few things are interesting. First, when the Buk is approached, the frame rate per second of the video drops to 15 fps. Furthermore, the Buk itself seems never to escape the blur initially cast over the entire view. Third, apparently, the Toyota RAV4, standing idle on the road with door open in front of the parked truck with Buk, was not part of the transport in Donetsk. JIT shows in an animation (see from 3:00) only a Jeep UAZ and a black van were escorting the truck. In Makeevka the transport comprised of 5 escorting cars (video) or 2, maybe 3 (satellite image). Though Aric Toler could not help himself gloating, the video does not stop to show the same problems Micha Kobs brought forward for the Paris Match stills – i.e. the time issue (shadows point to 11:05, not 10:23), the issue of the incorrect shadows (seem to belong to another load) and the issue of perspective. Buk vehicle side-skirt comparison, the technique Bellingcat used to show this Buk matched a Buk from the Russian Kursk brigade, would entail constructing a “pixel salat”, as Kobs dubbed it. The above mentioned issues and other features resulting from the bad quality of this footage render the video useless for forensic sound comparison with known Buks. On July 17, 2014 the Airliner MH-17 was shot down over Ukrainian territory occupied by pro-Russian separatists. Just a few hours later the culprit seemed to be certain. The chain of evidence includes phone calls the Ukrainian secret service SBU intercepted, a number of messages from social networks and anonymously mailed photos and videos. The crucial elements in this chain of evidence are two photos that were leaked from an anonymous source to the French magazine Paris Match. Both photos are of very low quality and show a supposedly unique Volvo tractor with a red Faymonville low loader that has loaded a missile defense system BUK-M1. This BUK system appears to have remains of an inscription, which was linked by the Social Media researchers “Bellingcat” to the Russian BUK “3×2”. According to Bellingcat the intercepted phone calls, the reported sightings in the social media and the photographic evidence prove that these Russian BUK equipped with 4 missiles was conveyed on the morning of July 17 by the Vostok Battalion of Donetsk to Snizhne and unloaded there. Shadow-casting analysis. Kobs shows the time of capture has to be set at 11:05-11:15 AM, debunking the claims made by Bellingcat and Ukraine-at-war. Significant feature of the cabin is comprised by the carvings on the back side. Kobs shows with this shadow-casting model sunlight is falling slightly from behind the truck, confirming the results the picture must have been taken at about 11:05-11:15 AM. 8. The heart of this chain of evidence – the Paris Match photos – are demonstrably false. Citizen investigator Max van der Werff discusses Michael Kobs” report here. In this blogpost he also usefully lists all reports Kobs has written about the MH17 case. 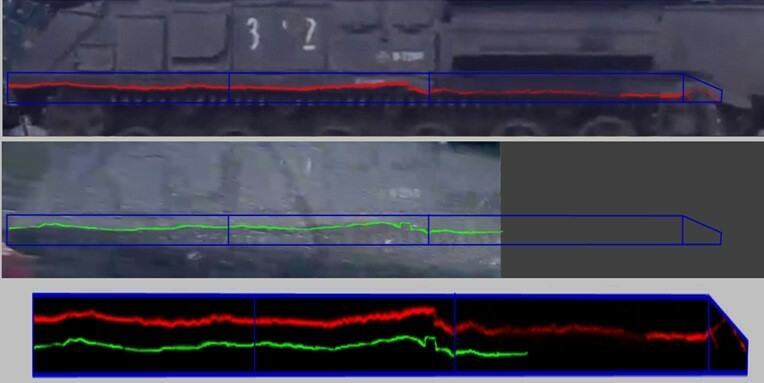 2. showing that the pixel soup Bcat made with their “side-skirt fingerprinting” to match the Buk to a Buk from the Russian Kursk convoy, is of no forensic value. What is valid for stills is valid for entire video too.